The Asháninka and the Yanesha' live near one another on the Andean piedmont of Peruvian Amazonia. These two peoples are best known for their healers and shamans, who treat afflictions with tobacco and forest lianas. They have a long tradition of resisting groups which threaten their survival: conquistadors, guerrillas, and, today, logging companies illegally exploiting their territory. 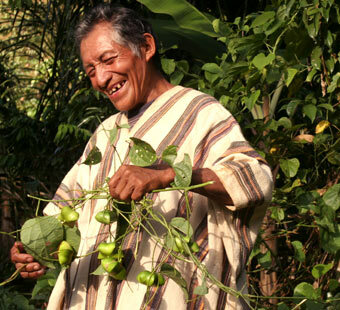 AÏNY works with three of their communities and the CECONSEC (Central de las Comunidades Nativas de la Selva Central), an organization representing 15,000 Peruvian Asháninka and Yanesha', for the production of Sacha Inchi oil.